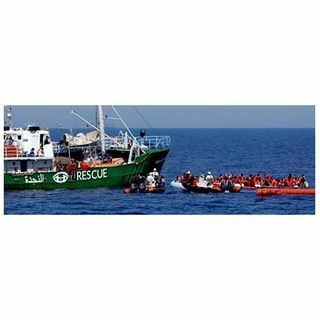 What role are Non-Governmental Organization (NGOs) playing in the ongoing crisis in the Mediterranean Sea as wave after of wave of people try to make the passage to Europe? Are they doing good? Are they filling a gap of lawlessness caused by government inaction, or increasing the problem? What are the motivations and goals of governments, international organizations, traditional NGOs, and new players on the scene? To discuss these question and related issues they raised in their two part ... See More series at War On the Rocks and CIMSEC will be returning guests Claude Berube and Chris Rawley. Claude is the director of the Naval Academy Museum and a Lieutenant Commander in the Naval Reserve. He is the author of the Connor Stark novels – THE ADEN EFFECT (Naval Institute Press, September 2012) and SYREN'S SONG (Naval Institute Press, November 2015.) He earned his B.A. in History and Soviet Studies, his M.A. in History from Northeastern University, and his M.A. in National Security Studies from the Naval War College. He is currently writing his doctoral dissertation through the University of Leeds on Andrew Jackson’s Navy. Chris is a Captain in the Naval Reserve where he is the commanding officer of a reserve unit focusing on building partnerships to enhance maritime security in the Gulf of Guinea. He is also founder and CEO of the agriculture investing company, Harvest Returns, and serves on the board of directors of the Center for International Maritime Security.